They're the wild horses that inspired Velma Johnston, aka Wild Horse Annie, to launch her successful nationwide crusade to protect America's mustangs. But ironically, the wild horses of the Virginia Range, a mountain range east of Reno, Nevada, were left out of the federal protections that Annie's years-long fight secured. Today they survive amidst intensive development that is bringing horses and humans in closer and closer contact. The inevitable conflicts that arise are currently solved by the Nevada Department of Agriculture (NDA) by trapping and removing horses who enter developments, habituate near roadways or otherwise inconvenience or endanger humans. One such wild horse family that wandered into harm's way was Black Jack, a magnificent black stallion, and his lovely mares and foals. Early in 2014, they were trapped by the NDA near Lockwood, Nevada and removed to the Carson City Prison for processing. By law, the State of Nevada considers these mustangs "estray livestock." If unclaimed, the state will put them up for sale at a livestock auction frequented by kill buyers who purchase horses and sell them for slaughter in Canada or Mexico. Virginia Range mustangs, like Black Jack and his family, are beloved by the community. Some residents have even moved to specific neighborhoods just to live amongst wild horses! So when neighbors see horses, who they have watched grow up, have babies and live peacefully for years, get captured, they want to save them. Until last year, rescuers were forced to outbid the kill buyers at these auctions to save the horses. But under an agreement negotiated by the American Wild Horse Preservation Campaign (AWHPC) under its founding organization Return to Freedom, rescue groups can now purchase horses directly from the state, thereby preventing them from going to a livestock auction. Such was the case with the "Lockwood 9" (as Black Jack and his family came to be known). They were purchased by AWHPC from the state in 2014 and cared for in a wonderful foster home for nearly a year. Within a few months, the Lockwood 9 became the Lockwood 13, as four beautiful foals were born. In his temporary 6-acre pasture, Black Jack remained the diligent leader of his family, which includes a colorful array of roan, grulla, bay and black horses with beautiful markings. As the winter settled in last year at the Lockwoods' foster home, we at AWHPC wondered if we would ever find permanent placement that would allow this closely-bonded wild horse family to remain together. Then, the best holiday present ever arrived in the form of an email from the owner of a private 7,000-acre sanctuary in California, a woman with a big heart and passion for saving horses. She prefers to stay anonymous but her heroic work includes saving close to 200 horses from slaughter. The sanctuary owner offered Black Jack and his band a permanent home where the family could stay together. Last month, the Lockwoods were transported to the sanctuary, and this week they were released to their spacious 300-acre pasture. 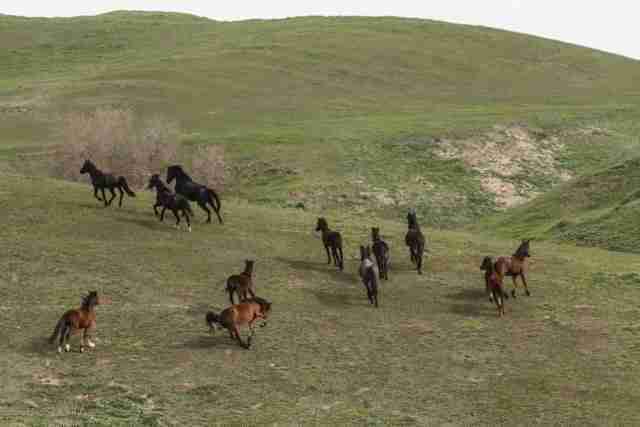 The palpable joy of the horses galloping and bucking at their newly-gained freedom has struck a chord with the public. Over 620,000 people have seen Elissa Kline's beautiful photos of the horses' release on Facebook in just two days. Watch a video of their release below! While Black Jack and his family are enjoying their new digs, the fight goes on to protect the remaining Virginia Range horses. Legislation signed in 2012 by Nevada Governor Brian Sandoval paved the way for a second cooperative agreement between AWHPC/Return to Freedom and the state. 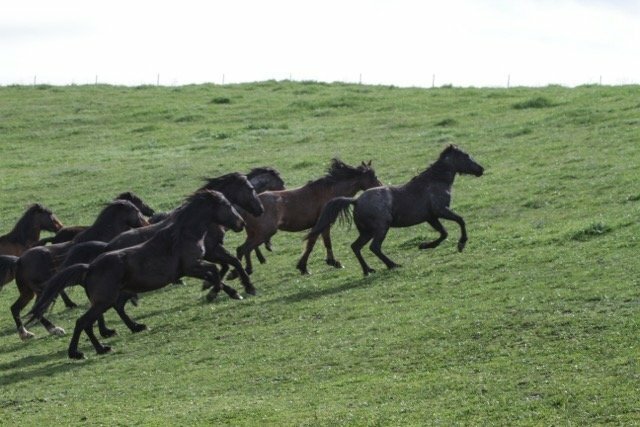 The agreement will allow a local coalition of organizations to pro-actively protect the horses by employing humane management strategies, including use of a fertility control vaccine to manage population numbers. Other tools - such as diversionary feeding and fencing - will be used to keep horses out of harm's way. The goal is to protect public safety, avert more removals and keep wild horses wild and free on the Virginia Range, where they remain a vibrant part of Northern Nevada's history and culture. Meanwhile, there are several Virginia Range horse families currently at the prison in need of permanent homes. If you can offer placement for these horses, or would like to help support their care, please send us an email to contact@wildhorsepreservation.org or visit our website: www.WildHorsePreservation.org.